create another ‘Free Bird?’ We don’t even trythat. Those are legendary songs. We just write what we write. It’s more about us just hangin’ out and being together and enjoying life and writin’ songs. My theory is like Ricky Nelson’s, ‘you can’t please everyone, so you’ve got to please yourself.’ If you’re happy with it at the end of the day, so be it.”Not as overtly political as its predecessor God & Guns, Breedfocuses more on the struggles of the working class, though the band make their thoughts on the direction of this country crystal clear on songs like the reverb-drenched “Poor Man’s Dream” and the blue-collar powerhouse “One Day at a Time.” “When we go in to record, we don’t go in with one certain mindset,” says Medlock. “We just go in and write about stuff we believe in, our experiences.”The band is tuned in to the tough times many Americans are going through, and they sing songs that might well help on that journey, or at least help let off some steam. “Skynyrd really thinks about how people are struggling and what’s goin’ on out here,” says Medlock. “We see it a lot, because we’re a working man and working woman’s band. We’ve got three generations under our belts, we know people have a tough time out there, and we share in that.”Gary Rossington won’t typically volunteer for political talk but he is an astute observer, and what he sees sticks in his craw. “I don’t like to talk politics,” he admits “I just don’t trust a lot of politicians. I think the country’s way off track, but we’ll get it back on, it’s too good of a thing to lose. We travel all around the country, there’s too many good people and good Americans who all want the same thing, just to get back on track the way we used to be.”Like it or not, with a title like God & Guns, the previous album was bound to be a lightning rod out of the box. “I couldn’t believe how well God & Gunswas accepted when it came out, in Europe, Australia, South America, here in the States; everybody we talked to, 99% of it was positive feedback,” says Medlock. “My whole thing was, we’ve got to go in the studio this time and step up, we’ve got to do at least what God & Gunsdid, or one better. And, in my opinion, I think we accomplished that. I’m looking forward to going out and playing some of this record live, along with our classic material, and taking it to the people and letting the people make their decision.”Odds are, the “people,” specifically, the aforementioned Skynyrd Nation, will loveLast of a Dyin’ Breed, and anyone who hasn’t checked into what this band has been up to for a while will likely be blown away. 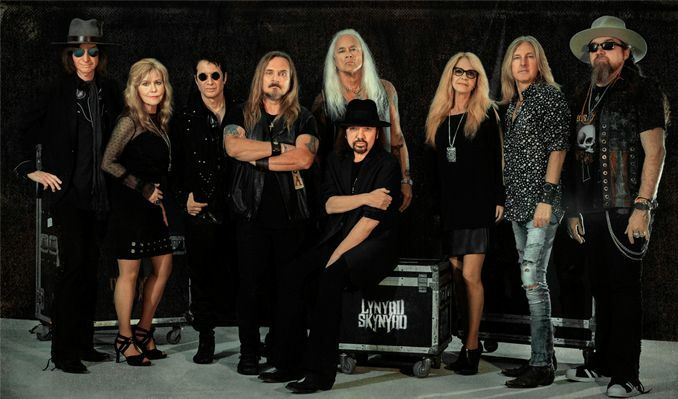 As for their part, Skynyrd will, per usual, indeed be taking their music to the people, as fans in Europe and North America will have a chance to catch the band on tour through the end of 2012 and beyond. good time, which, regarding the latter, founding member Gary Rossington says is very much the case. stage of their career, on a roll. immediacy. In short, it’s rock ‘n roll for the times. aced Powell on the God & Guns tour. the gritty triumphs that follow. beloved bands of all time.